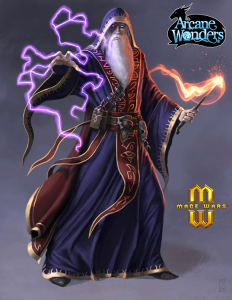 Arcane Wonders and Greenbrier Games have teamed up to bring one of the Mage Wars wizards to Yashima. Greenbrier games has another successful project on their hands and Arcane Wonders, publisher of Mage Wars, announces a cross over partnership. One of our most popular mages in Mage Wars will cross over to do battle from the arenas of Etheria to the Legends of the Kami Masters. The Wizard will become an unlockable upgrade and playable in their game, including a miniature sculpt!